I love this time of the year in Dubai. Those few weeks in spring before it gets too hot. Where the sky is still sort of clear before endless months of yellowish haze set in. Now is the time when local produce seems at their best, soaking up the sun and warmth, before they wither in the heat. Traditionally, we are growing our own tomatoes and a few other veggies in our garden. My husband thinks I have a green thumb. But actually, I am not very caring with my plants. Apart from sowing the seeds in a spot that looks good to me, and watering them regularly, I leave them to themselves. Obviously, the Dubai winter is warm enough and brings enough sunshine to make tomatoes, herbs, green beans and peppers grow in abundance. Organic farms have opened here in the UAE only in recent years and their choice of local produce is vast these days. Many vegetables that don't grow in my garden (due to limited space or failed attempts of growing them myself), I can buy with the best of a health and environmental conscience, like cucumbers, okras and aubergines. At a recent job project, I was introduced to oven-roasted okras. Apparently, when oven-roasted, they do not become as slimy inside, and the outside was almost crispy. Ever since I had eaten the oven-roasted version, I wanted to replicate it. While mine did not become as crispy, they were surely not as slimy as the boiled or steamed version. 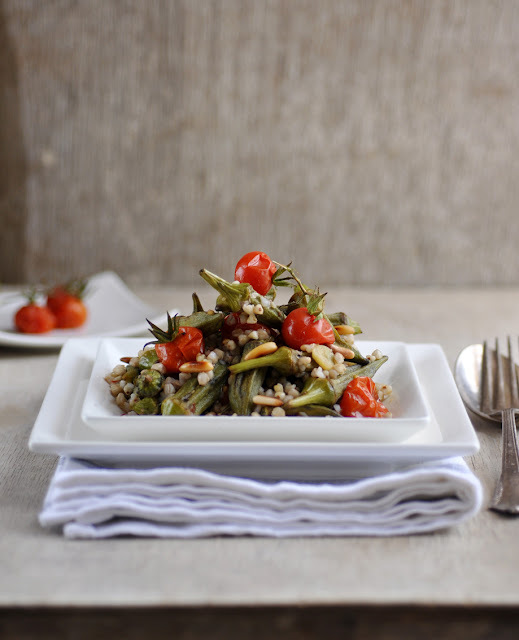 The combination of okra with tomato is a classic, although it was new to me. The acidity of the tomatoes complements the mildness of the okras. Seasoned with just garlic, salt, pepper and some chili flakes they make a perfect side dish or salad for al fresco dining. To give it a bit more substance and to make it a meal by itself, I added buckwheat in a simple lemon olive oil dressing and some roasted pine nuts for texture. It was so good, I ate it all by myself. This is a perfect weekday lunch salad that can be made it advance. Bon appetit! Spread okra and tomatoes on a baking sheet. Don't overcrowd. Combine 1 tablespoon of olive oil with chili flakes, sliced garlic. Pour mixture over the vegetables. Season with salt and pepper. Toss until well coated. Roast for 20-25 minutes. In the meantime, add buckwheat groats to 2 cups of slightly salted water. Cover and cook over low heat until all liquid has been absorbed, about 10-15 minutes. Set aside to let cool. Once cooled down a bit, combine olive oil and lemon juice and stir into the buckwheat. Season with salt to taste. Roast the pine nuts in a dry pan over low heat until golden brown, shaking the pan regularly to avoid burning. Set aside. In a serving bowl, gently combine buckwheat and roasted vegetables. Sprinkle with toasted pine nuts. Can be served warm, at room temperature or cold.